Background: Normal healthy skin has potential of hydrogen (pH) range of 5.4-5.9 and a normal bacterial flora. Use of soap with high pH causes an increase in skin pH, which in turn causes an increase in dehydrative effect, irritability and alteration in bacterial flora. The majority of soaps and shampoos available in the market do not disclose their pH. Aims and Objectives: The aim of this study was to assess the pH of different brands of bathing soaps and shampoos available in the market. Materials and Methods: The samples of soaps and shampoos were collected from shops in the locality. The samples of different brands are coded before the analysis of the pH. Solution of each sample was made and pH was measured using pH meter. Results: Majority of the soaps have a pH within the range of 9-10. Majority of the shampoos have a pH within the range of 6-7. Conclusions: The soaps and shampoos commonly used by the population at large have a pH outside the range of normal skin and hair pH values. Therefore, it is hoped that before recommending soap to patient especially those who have sensitive and acne prone skin, due consideration is given to the pH factor and also that manufacturers will give a thought to pH of soaps and shampoos manufactured by them, so that their products will be more skin and hair friendly. Many researches have been conducted on the measurement of potential of hydrogen (pH) of skin and effects of soaps on skin pH. However, there are not many studies on the pH of soaps and shampoos that are commonly available in the market and those used by the majority of the population. Unfortunately, pH is not mentioned in the labels of many products. The objective of this study was to assess the pH of different brands of bathing soaps and shampoos available in the market. Samples of branded soaps and shampoos were collected from shops in the locality. They included bathing soaps, Anti-acne soaps, ayurvedic soaps and those promoted for dermatological conditions. A sample of homemade soap was also collected. We also collected a sample of imported soap to compare with the same brand in the Indian market. Readings of pH were taken using ELICO L1613 pH meter after calibrating with the standard solution supplied by NICE Chemicals Pvt. Ltd., Kochi, Kerala (pH = 7). The samples were coded before the analysis of the pH. Procedure was divided so that one person was involved in measuring the sample, another in coding, then another in mixing and the last person in the measurement of pH, so that the person involved in measurement of pH does not know the identity of the sample being tested. The pH of distilled water used ranged from 6.24 to 6.88. Soap sample weighing 150 mg was mixed in 15 ml distilled water without producing much lather. It was kept undisturbed for 24 h for maximum dissolution of soap. Then the pH of each sample was measured. Sample of shampoo of 1.5 ml is taken in a glass beaker and water is added to the sample to make its volume to 15 ml. Mixing is done well without producing lather. The solution is kept undisturbed for 30 min. Then the pH of each sample was measured. Of the 64 samples of soaps tested, 53 had a pH within the range of 9.01 to 10. Only two samples were in the range of skin pH [Table 1]. Five of the 64 samples analyzed were promoted as anti-acne soaps. Of these, three were within the range of 9.01 to 10 and two in the range of 10.01 to 11 [Table 2]. 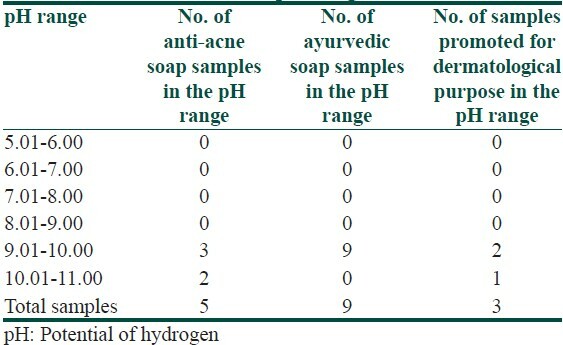 Nine of the 64 samples, which were marked as ayurvedic soaps had a pH in the range of 9.01 to 10 [Table 2]. Three of the 64 samples were promoted for dermatological purpose. Two out of three had a pH in the range of 9.01 to 10 [Table 2]. Homemade soap had a pH range in 9.01 to 10.00. The sample of imported soap had a pH in the range of 9.01 to 10, which is same as that of the same brand in Indian market. Different varieties of the same brand were also tested. The difference in the pH between varieties of the same brand was within 0.35. The pH of various varieties of Brand coded A was within 9.62 ± 0.08, Brand B was within 7.445 ± 0.125, Brand C was within 9.79 ± 0.16 and Brand D was within 9.88 ± 0.10. Of the 38 samples of shampoos tested, 24 had a pH within the range of 6.01 to 7. Seven of the 38 samples had pH in the range of 7.01 to 8, six in the range of 5.01 to 6 and only one in the range of 4.01 to 5 [Table 3]. The results of our study revealed that only 3.125% of the soap samples tested had a pH corresponding to that of skin pH and another 3.125% had a neutral pH. Upon reviewing these products, it was found that these products have mentioned their pH and the findings of our study were consistent in the pH claimed by them. The rest of the products with alkaline pH have not mentioned anything regarding their product's pH value. Even those products, which were promoted as anti-acne soaps had a pH above nine. Since studies have proved that propionibacterium is implicated as one of the factors of pathogenesis of acne and that their count increases on the use of alkaline soap, it is very important that at least these products have a pH consistent with that of skin pH. Even, the products prescribed for dermatological purposes had an alkaline pH. Ayurvedic soaps, which claimed to be better than other soaps were not skin friendly in the aspect of their pH. In a study done by Tyebkhan G, in which pH paper was used for measuring the pH of soaps/cleansers, it was found that the soaps commonly used by the population at large have a pH ranging between 7 and 9. Also, only 3 samples of those tested had a pH in keeping with the normal skin. But in our study, we have found that majority of the samples had a pH ranging between 9.01 and 11. Also, only 2 samples of those tested had a pH corresponding to that of the skin pH. The difference may be due to greater accuracy of the pH meter used in our study when compared to the pH paper. Acid balanced shampoos are recommended generally by experts and in our study we found that 81.58% of shampoos had an acidic pH. When compared to soaps, shampoos are better in respect to their pH. The soaps and shampoos commonly used by the population at large have a pH outside the range of normal skin and hair pH values. Therefore, it is hoped that before recommending soap to patient especially those who have sensitive and acne prone skin, due consideration is given to the pH factor and also that manufacturers will give a thought to pH of soaps and shampoos manufactured by them, so that their products will be more skin and hair friendly. 1. Braun-Falco O, Korting HC. Normal pH value of human skin. Hautarzt 1986;37:126-9. 2. Gehring W, GehsenM, Zimmerman V, Gloor M. Effects of pH changes in a specific detergent multicomponent emulsion on the water content of stratum corneum. J Soc Cosmet Chem 1991;42:327-33. 3. Baranda L, González-Amaro R, Torres-Alvarez B, Alvarez C, Ramírez V. Correlation between pH and irritant effect of cleansers marketed for dry skin. Int J Dermatol 2002;41:494-9. 4. Korting HC, Kober M, Mueller M, Braun-Falco O. Influence of repeated washings with soap and synthetic detergents on pH and resident flora of the skin of forehead and forearm. Results of a cross-over trial in health probationers. Acta Derm Venereol 1987;67:41-7. 5. Schmid-Wendtner MH, Korting HC. The pH of the skin surface and its impact on the barrier function. Skin Pharmacol Physiol 2006;19:296-302. 6. Mukhopadhyay P. Cleansers and their role in various dermatological disorders. Indian J Dermatol 2011;56:2-6. 7. Tyebkhan G. A study on the pH of commonly used soaps/cleansers available in the Indian market. Indian J Dermatol Venereol Leprol 2001;67:290-1. This is the first study in India, which used a pH meter to measure the pH of commonly used soaps and shampoos instead of pH paper. Hence, it is more accurate.